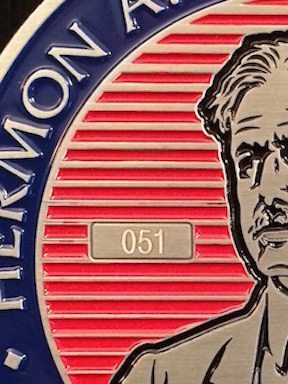 WELCOME to the “Hermon A. MacNeil” — Virtual Gallery & Museum ! 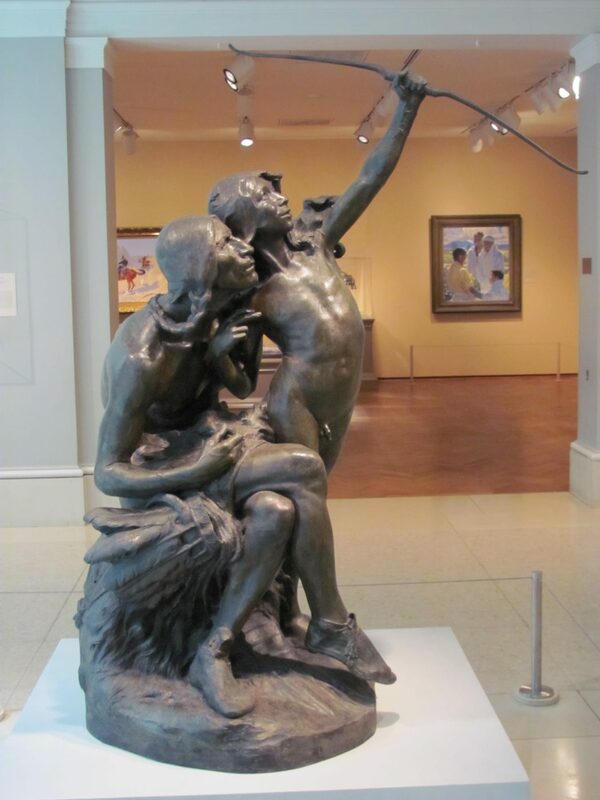 ~ This Gallery celebrates Hermon Atkins MacNeil, American sculptor of the Beaux Arts School. 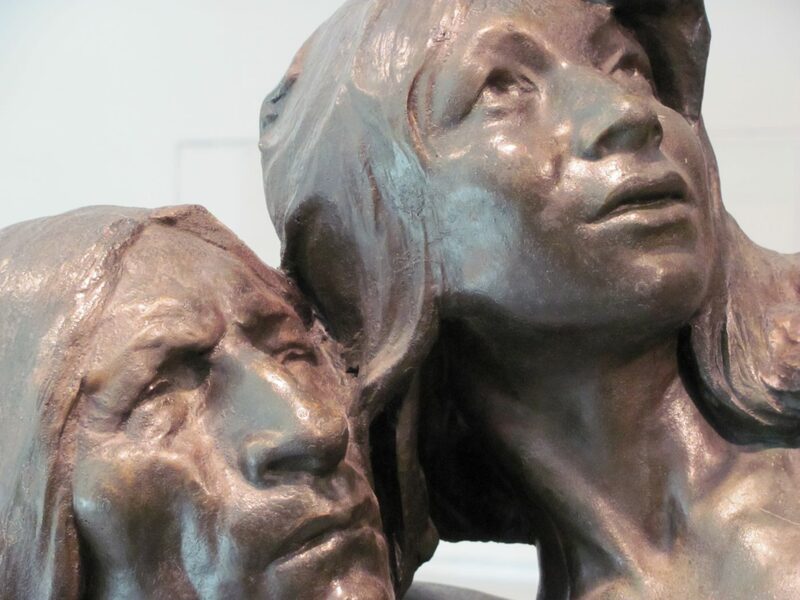 MacNeil led a generation of sculptors in capturing many fading Native American images and American history in the realism of this classic style. 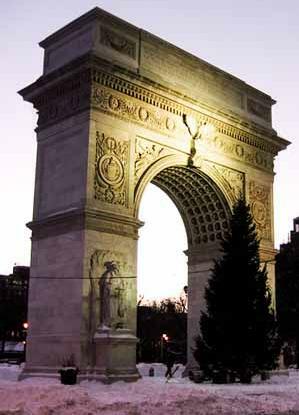 ~ World’s Fairs, statues, public monuments, coins, and buildings across to country. Hot-links (on the lower right) lead to photos & info of works by MacNeil. ~ Hundreds of stories and photos posted here form this virtual MacNeil Gallery of works all across the U.S.A. New York to New Mexico — Oregon to South Carolina. This website seeks to transport you through miles and years with a few quick clicks of a mouse or keyboard or finger swipes on an iPad. 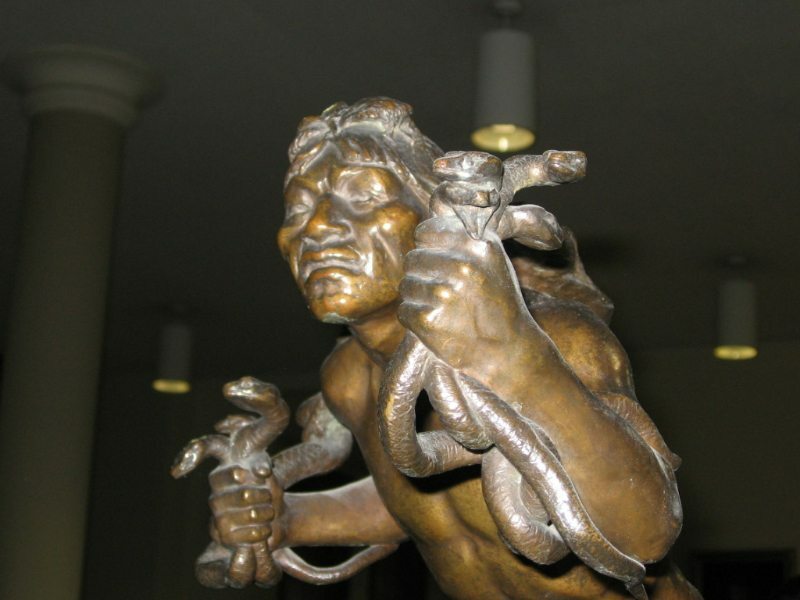 Perhaps you walk or drive by one of MacNeil's many sculptures daily. Here you can gain awareness of this artist and his works. 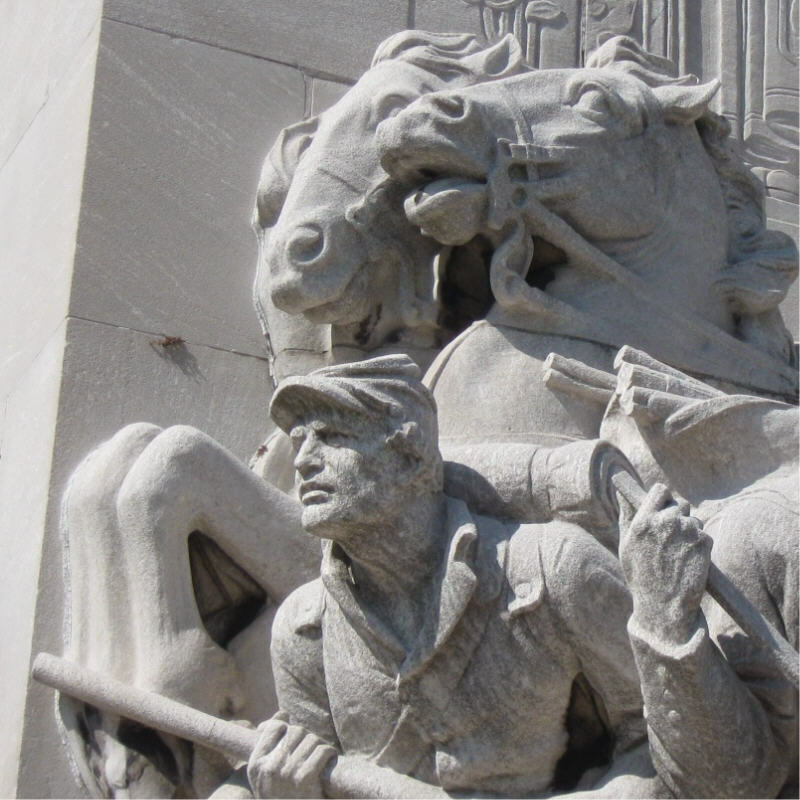 For over one hundred years his sculptures have graced our parks, boulevards, and parkways; buildings, memorials, and gardens; campuses, capitols, and civic centers; museums, coinage, and private collections. Maybe there are some near you! I never met Hermon MacNeil. I never met my maternal grandfather, Tom Henry McNeil. ALL OF LIFE and our family histories are filled with people we HAVE NEVER MET. The photos can also be viewed in this previous post. 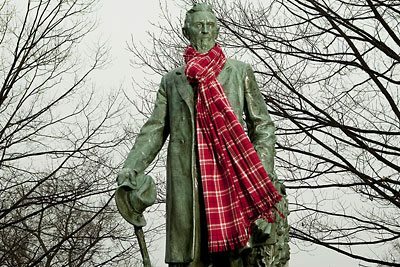 Ezra Cornell statue at Cornell University, Ithaca, NY was dedicated in 1918 after WWI. 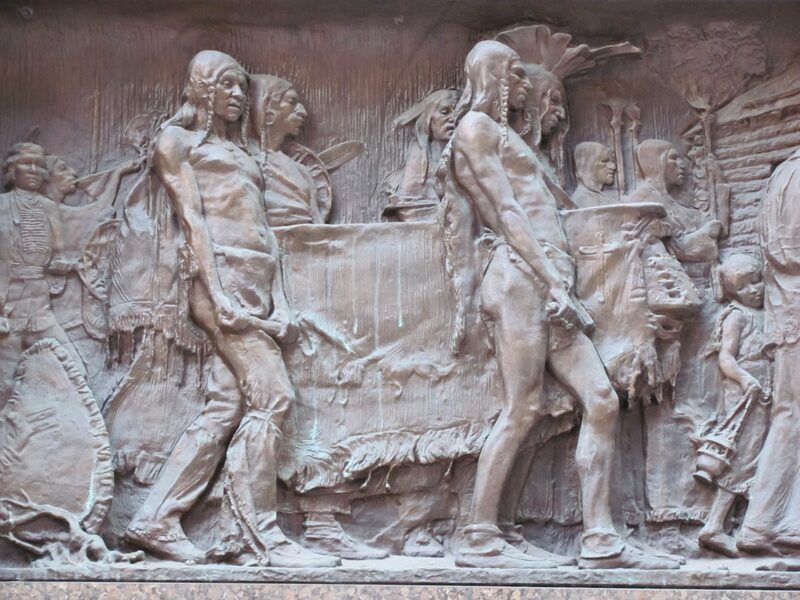 Dwight Moody, WWI Monument – Flushing NY; Portland – Chief Multnomah – Coming of the White Man. MacNeil Clan history, like all family history, is filled with people we have never met. One MacNeil who has always fascinated me is Hermon Atkins MacNeil. Researching “Uncle” Hermon has also led me to another amazing man, Robert Lister MacNeil. Both men were present when the Clan MacNeil Association was formed ninety-three years ago. On May 26, 1921, the Clan MacNeil Association of America was organized in New York City. 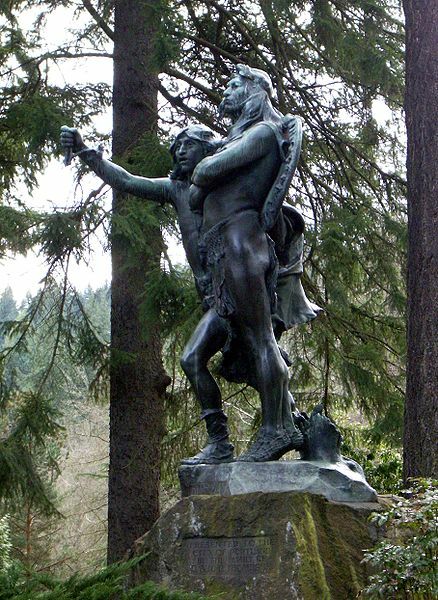 Central to that moment were Robert Lister MacNeil, (The MacNeil of Barra – 45th Chief of the Clan), and Hermon Atkins MacNeil, a sculptor, who served as the clan’s first president. 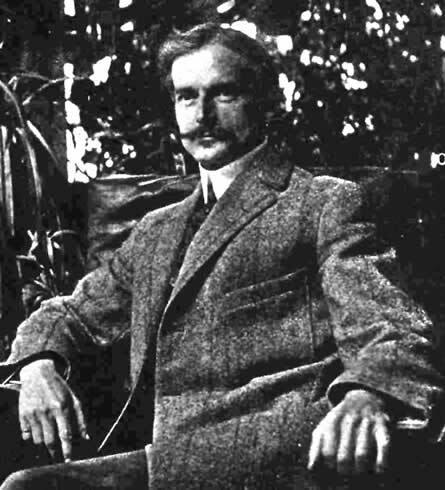 At that time, Robert Lister was 32 years of age, a practicing architect in New York City, and a veteran of the First World War. 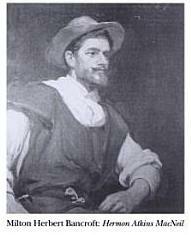 He had succeeded to the chiefship of the Clan MacNeil just six years earlier. His dreams of the Isle of Barra and restoring Kisimul Castle (as told in his book The Castle in the Sea) were but faint hopes that would await decades and the efforts of many MacNeils for their accomplishment. Dan “Neil” Leininger in a MacNeil kilt at Kisimul Castle, Isle of Barra, Scotland 2014. WHAT A TOUR it was!!! His other kinsman was Hermon Atkins MacNeil. 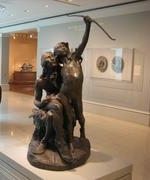 Hermon was the older of the two, an accomplished sculptor, also practicing in New York City, he had already created a myriad of statues, sculptures, monuments, as well as, the U.S. 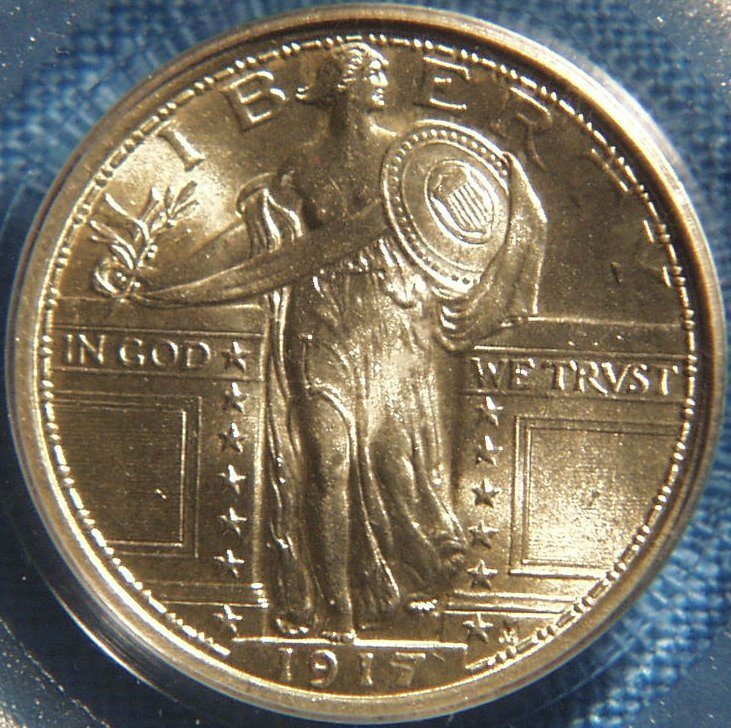 Standing Liberty Quarter first minted in 1916. 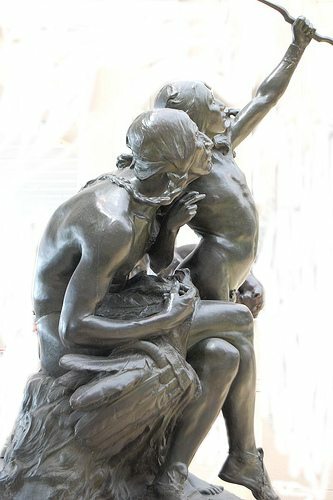 Although these two MacNeils were 23 years apart in age, they were both trained in Paris at the Ecole des Beaux Arts, a school for architects and sculptors in the Classic Greco-Roman styles. A lasting bond between them formed through their shared artistic talents, professional skills, and years of Clan MacNeil activity. 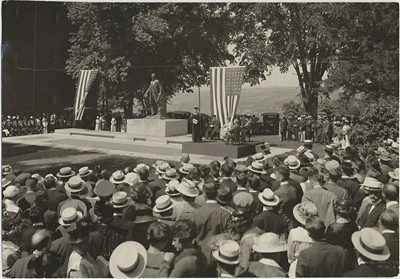 Hermon MacNeil designed a bronze plaque that was unveiled and dedicated on May 28, 1928 on the campus of Flora MacDonald College in Red Springs, NC. The plaque commemorated the 1735 landing of Neil MacNeil of Jura, Scotland with 350 followers. This group made up mostly of clan members landed at the Cape Fear Settlement in North Carolina. The plaque was placed on a red granite stone and marked another clan project shared by these two men. 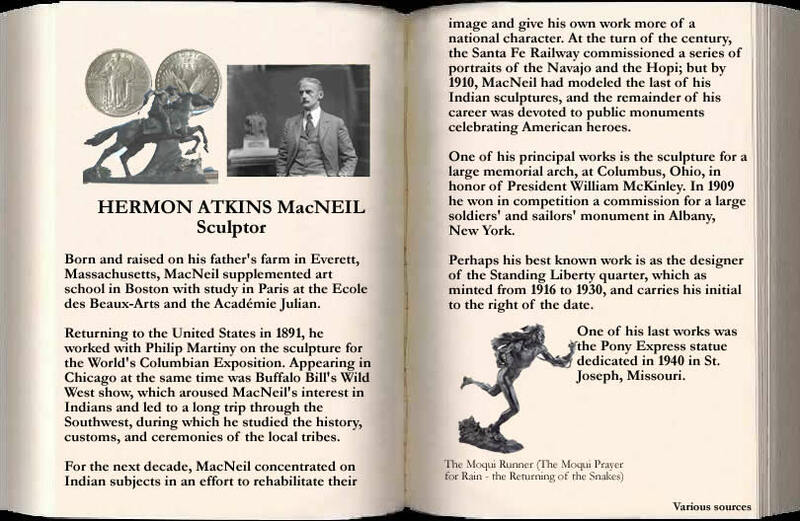 In his later years, Robert Lister stated: “Hermon was an outstanding sculptor and one of my dearest friends all the rest of his life.” In 1970, six years after publishing those words, Robert Lister MacNeil died at the age of 81. Twenty-three years earlier (in 1947), Hermon Atkins MacNeil had died, also at the same age of 81. All of the above was discovered as I “searched for Uncle Hermon.” I never met either of these two MacNeil men. The more I learn of them both, the more striking I find the parallels in their lives. MacNeil roots. The third MacNeil man that I never met was my own grandfather, Tom Henry McNeil (1860-1932). Whenever my mother spoke of her father or of her “Uncle Hermon,” I would see a certain smile on her face and a sparkle in her eye. Emotionally, recalling her McNeil memories seemed to take her to “a very pleasant place.” On the MacNeil family tree, her father and Hermon MacNeil were first cousins. But “Uncle Hermon” was what the whole family always called him and what he always considered himself to be. Though she did not share them often, my mother’s stories instilled in me a sense of “wonder” about these two “MacNeil” men. Genetically, my mother gave all of us six children her MacNeil biology, but when I first realized that my parents also gave me the middle name of “Neil,” I felt some extra portion of my Scottish ancestry. That feeling has only grown as I get older. My grandfather McNeil died before I was born. I was just two years old when Hermon MacNeil died. Now as an old man myself this MacNeil heritage and my memories of the sparkle in mother’s eyes have expanded my interest in these three MacNeils, and in the many other MacNeils that I have yet to meet. MacNeil pursuits. So I am pursuing my MacNeil Clan interests in several ways. 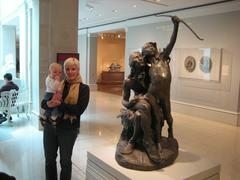 In 2010 I formally began searching for “Uncle Hermon” by building a “digital gallery” of the life and work as a sculptor. 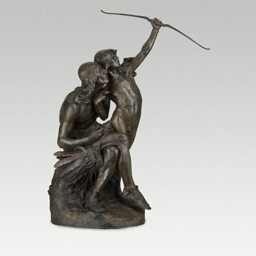 I built HermonAtkinsMacNeil.com, a website dedicated to making his sculpture and career available to the world. A web search of the name “Hermon MacNeil” will take you there. 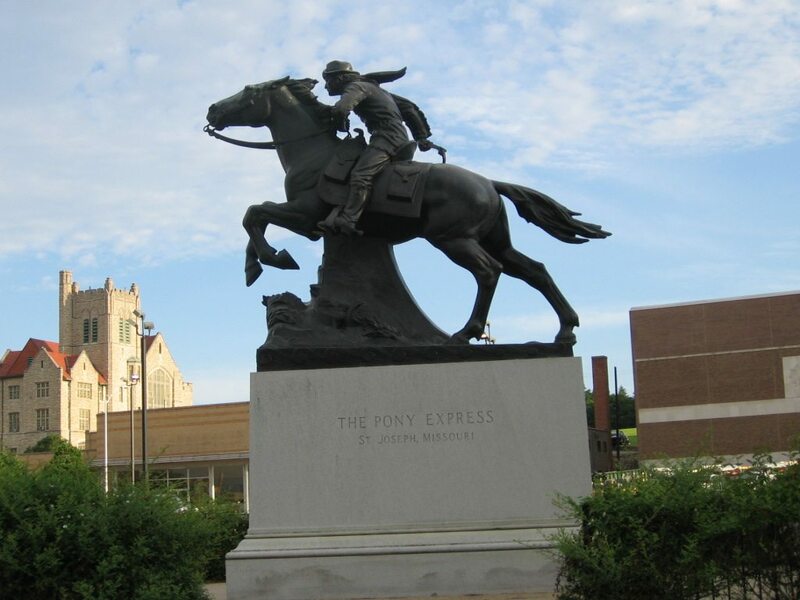 His sculptures, statues, monuments are scattered from Washington, DC to Portland, Oregon, and from New York City to Gallup, New Mexico. Now this virtual gallery features over 500 photos and 125 stories of Hermon MacNeil’s life and work. 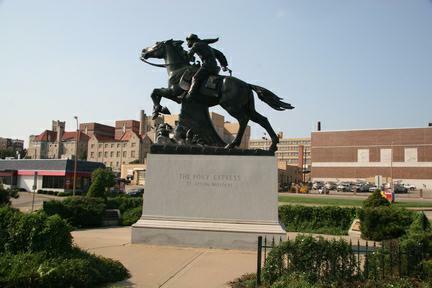 There you can see his statues of George Washington from Washington Arch, NYC; Ezra Cornell at Cornell University, William McKinley at Columbus, Ohio; Abraham Lincoln at Champaign, Illinois; Pony Express at St. Joseph, Missouri; Pere Marquette in Chicago; and monuments in Philadelphia, Charleston, Albany, and Flushing, and dozens of other cities. 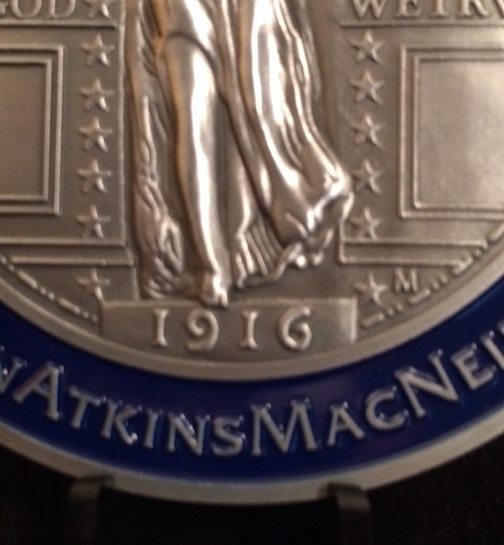 In 2013 I became a member of the Clan MacNeil Association of America. I did not know its existence until I saw the 1928 news story of the MacNeil plaque dedication in Red Springs. For the last three yearsI have shared “MacNeil stories” at our annual family reunion of my siblings and our children and grand children. In August 2013 I went to my first Highland Festival. My nephew in Colorado told me about the attended the Longs Peak Scottish Irish Highland Fest in Estes Park. What a great celebration of Celtic pride and heritage. Donna and I have booked our spots on the 2014 MacNeil Clan Tour of Scotland. We reserved our passage before I received the Fall/Winter issue of The Galley with Rory MacNeil’s invitation to the World Gathering of the Clan MacNeil on the Isle of Barra from August 4-7, 2014. We hope to meet some of you there this summer. Categories : Bust, Clan MacNeil, Cornell, Hermon A. MacNeil bio, Illinois, In Search of "Uncle Hermon", Location, MacNeil Month, Missouri, New York City, Portland, Sculptures, South Carolina, Statue, University of Illinois, Vincennes, Washington D.C.
Dan Leininger holds the “Galley” for Summer 2014 with MacNeil’s “Pony Express” statue on the cover and an 8 page feature story inside. The Galley edited by Vicki Sanders Corporon titles Dan’s story as “Clan MacNeil Connections and Hermon Atkins MacNeil.” The feature and photos fill 8 pages in the “Galley” issue for Spring/Summer 2014. 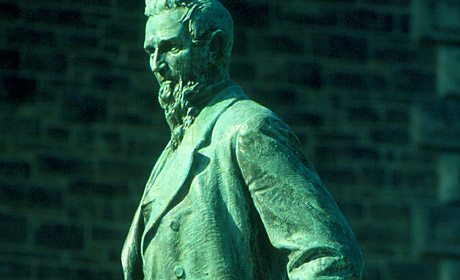 Ezra Cornell statue at Cornell University, Ithaca, NY was dedicated in 1918 after WWI. Page 19 of the “Galley” (This Photo from Cornell University is Courtesy of Chris Carlsen). 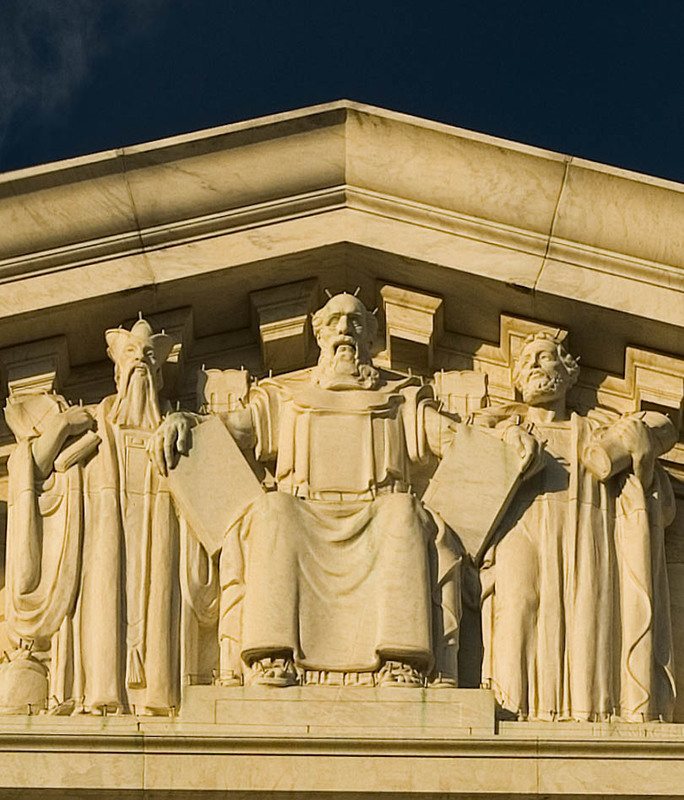 The featured photos include the East Pediment of the Supreme Court Building in Washington, D.C. (with a detail close-up of Moses, Confucius, and Salon); The George Rogers Clark monument in Vincennes, IN at the site of his victory over the British in 1779; Confederate Defenders of Charleston, SC; the Young Lawyer Abraham Lincoln in Champaign, IL; General George Washington on the Washington Arch, NYC, NY. 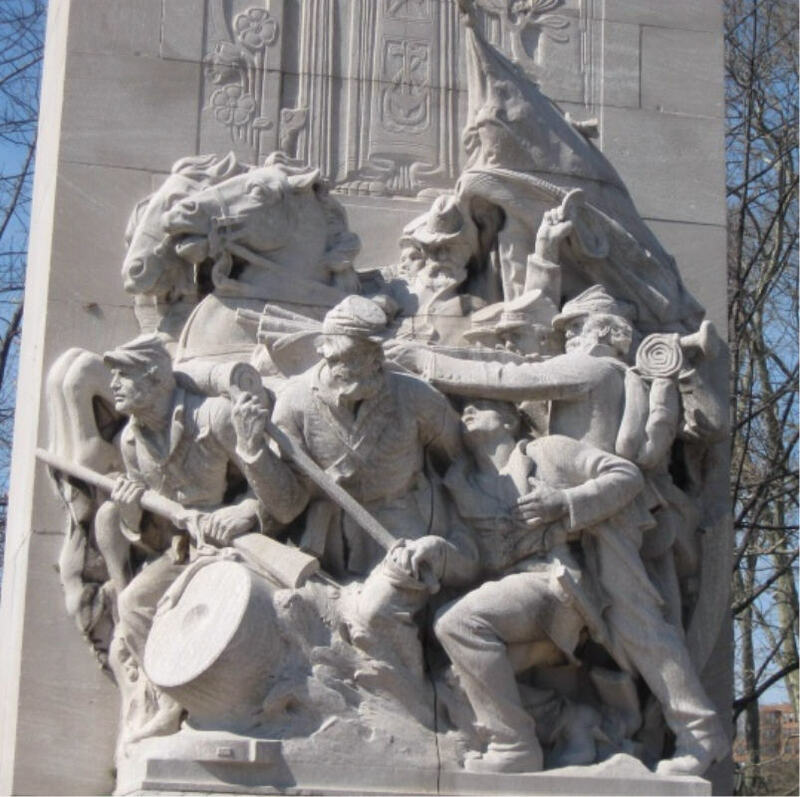 Also in this article are photos of the grouping Coming of the White Man in Portland, OR; The WWI Angel of Peace Monument in Flushing NY; and a bust of Dwight L. Moody (who MacNeil sketched during the 1893 Chicago Worlds Fair. Categories : Bust, Clan MacNeil, Cornell, Hermon A. MacNeil bio, In Search of "Uncle Hermon", Location, Missouri, New York, New York City, Portland, Saint Joseph, Statue, University of Illinois, Vincennes, Washington D.C.
Hermon MacNeil was the first president of the Clan MacNeil Association of America. This summer, the Galley will contain a feature article about him, written by Dan Leininger, webmaster of this website — HermonAtkinsMacNeil.com. The previous posting of February 8, 2013, entitled, “MacNeil Kinsman ~ Hermon Atkins MacNeil and Robert Lister MacNeil,” tells part of the story of these two men. Sculpture photos of the Supreme Court (East Pediment); George Washington from the Washington Arch in NYC; Abraham Lincoln from University of Illinois; Ezra Cornell at Ithaca; Confederate Defenders Monument (1932) Charleston harbor, SC; and George Rogers Clark at Vincennes will illustrate the story. On May 26, 1921, the Clan MacNeil Association of America was organized in New York City. Central to that moment were Robert Lister MacNeil, (The MacNeil of Barra – 45th Chief of the Clan), and Hermon Atkins MacNeil, the clan’s first president. Stay tuned for more as the publication is released. 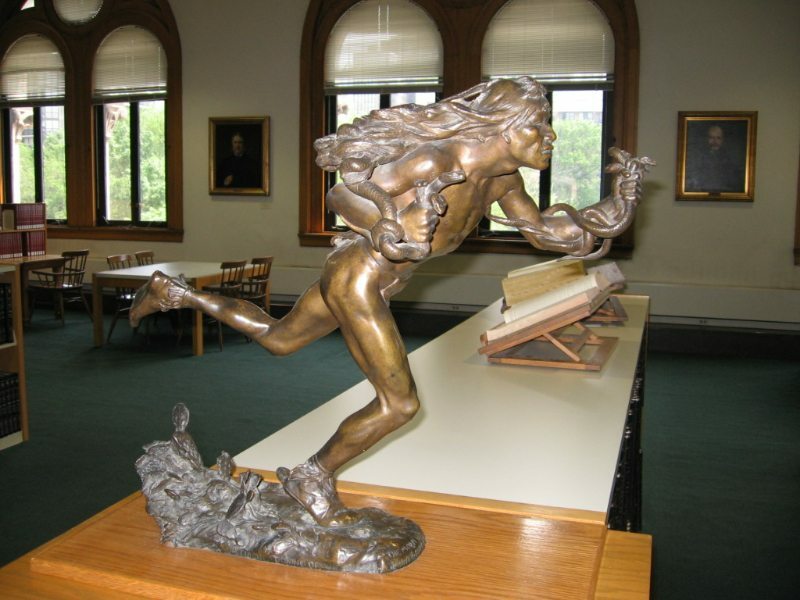 Categories : Bronze Plaque, Clan MacNeil, Cornell, Hermon A. MacNeil bio, Illinois, Indiana, Location, New York City, Sculptures, Statue, University of Illinois, Urbana, Vincennes, Washington D.C.
SUPREME COURT – Arrival at last! 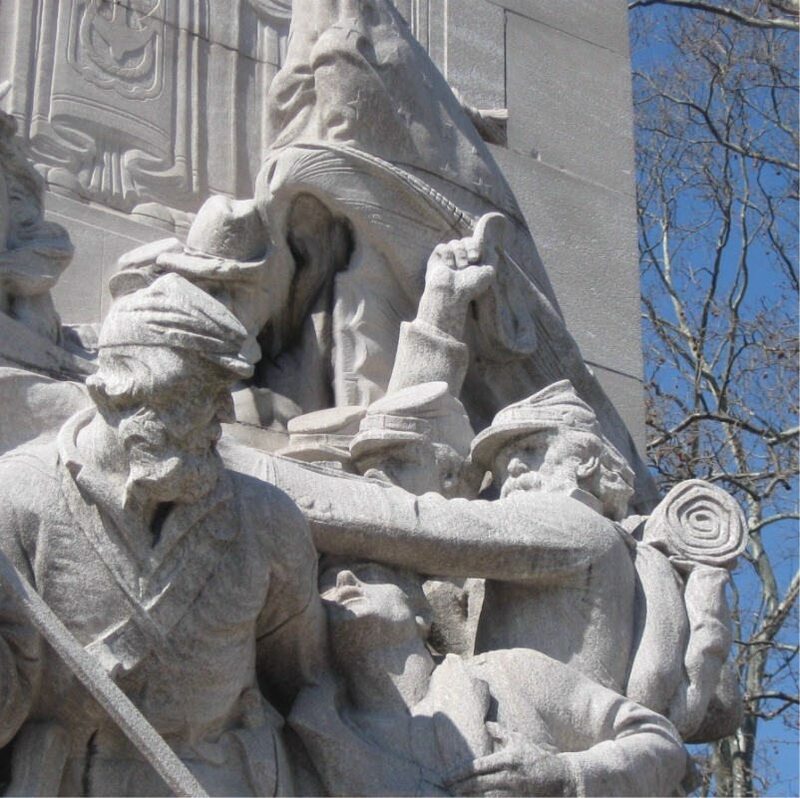 So said Aesop in the fable of the “Tortoise and the Hare.” And those are the two last figures that Hermon A. MacNeil placed as ‘bookends’ on either end of the East Pediment of the US Supreme Court Building. 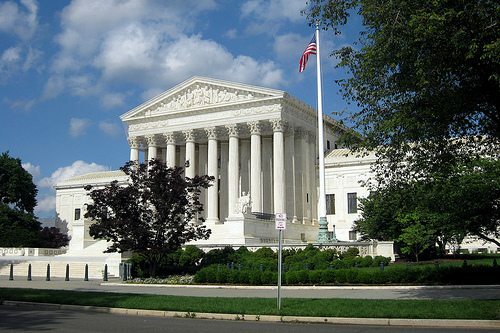 On our recent visit to Washington, D.C., we slowly made our way to the Supreme Court Building, we walked steadily around to the East Pediment (back side) passing the barricades for all the current landscape construction. 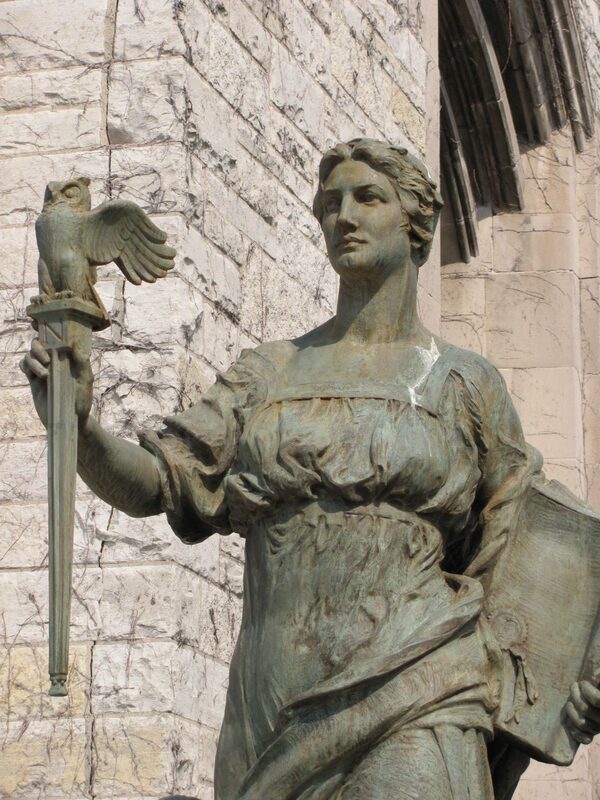 There, hidden high on the seldom-seen back side of **Cass Gilbert’s last architectural achievement, rests the eleven marble figures of Hermon A. MacNeil’s tribute to “Justice: The Guardian of Liberty.” Unless you walk around the building you will miss this massive work of art. 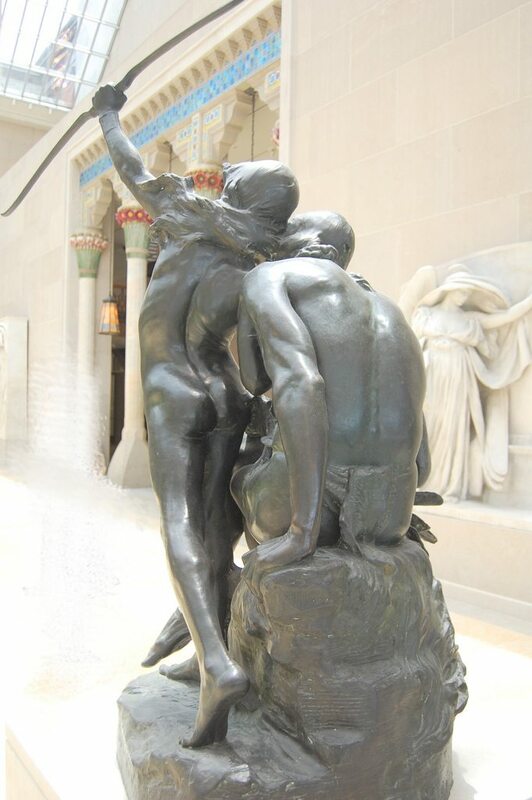 The three MacNeil sculptures above the main entrance of Cass Gilbert’s ‘Palace of fine Arts’ are examples of the Beaux Arts style of World Fairs of this era. (http://www.slam.org/). 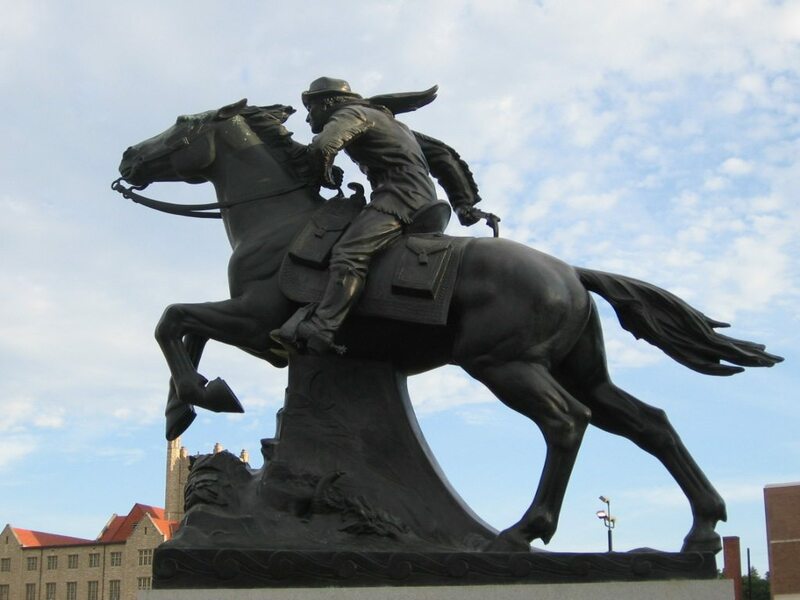 Categories : 1904 Louisiana Purchase Exposition - St. Louis MO, Hermon A. MacNeil bio, Location, Saint Louis, Sculptures, Statue, Washington D.C.
Daniel Chester French’s most famous creation is his seated Lincoln. 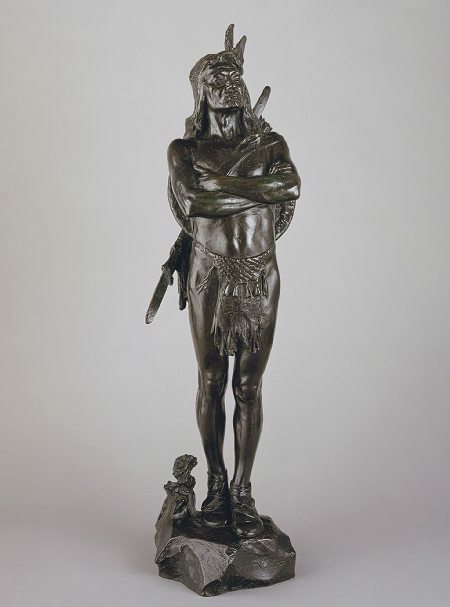 This work won him much acclaim, including a National Sculpture Society Special Honor Award in 1929. 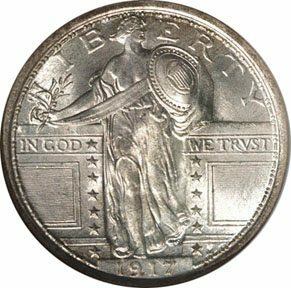 Seated In the marble throne supported by two Roman fasces symbols, Lincoln gazes contemplatively over the "preserved Union." 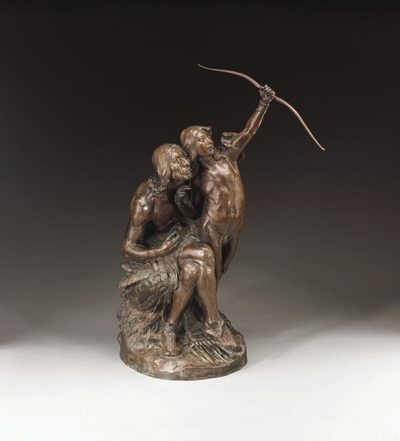 The National Sculpture Society created a Special honor Award presented in 1929 to Daniel Chester French (lt). Presenters were Hermon A. MacNeil (ctr), Herbert Adams (rt.) 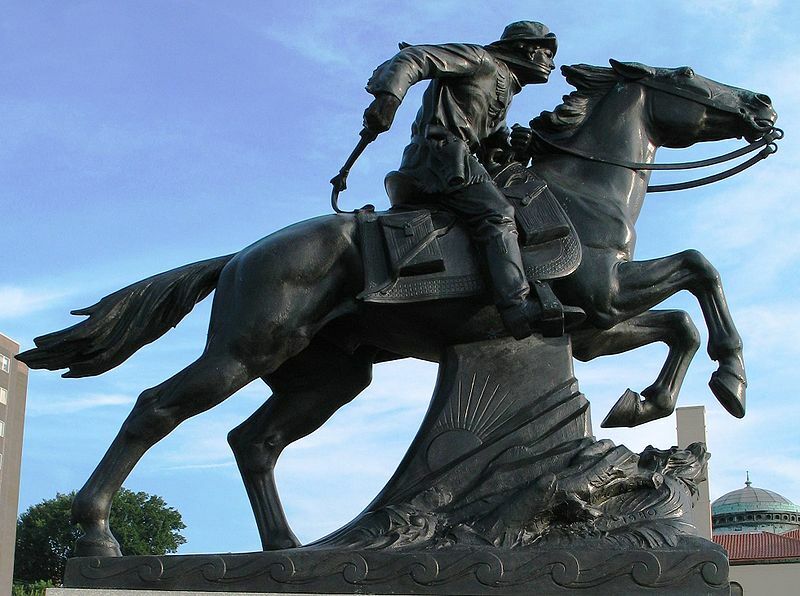 and not in this picture are A. A.Weinman, and James Earle Fraser. Here the men admire the Special Honor Award sculpted by Laura Gardin Frazer. 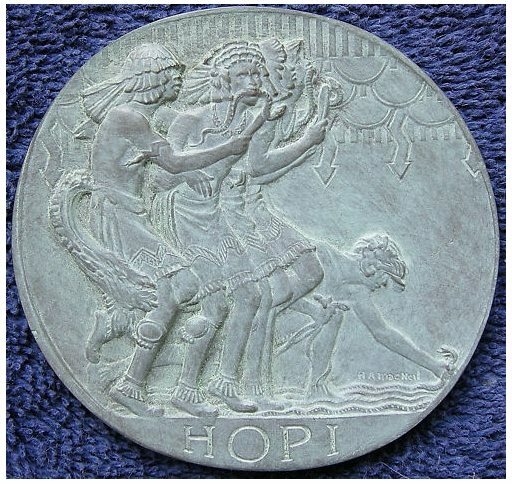 The screen capture (above) shows a frame from the 1929 silent movie “The Medal Maker.” This video frame shows two of the four presidents of the National Sculpture Society presenting the NSS‘s ‘Special Award Medal’ to Daniel Chester French (left). Hermon MacNeil is in center (with hand gesture). Herbert Adams is on right. French (1850-1931) died just 2 years after this video was made. 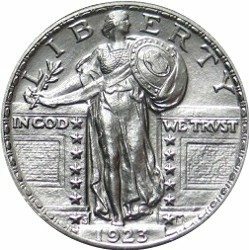 The making of the Medal by Laura Gardin Fraser is told in “The Medal Maker” (CLICK HERE FOR MORE). 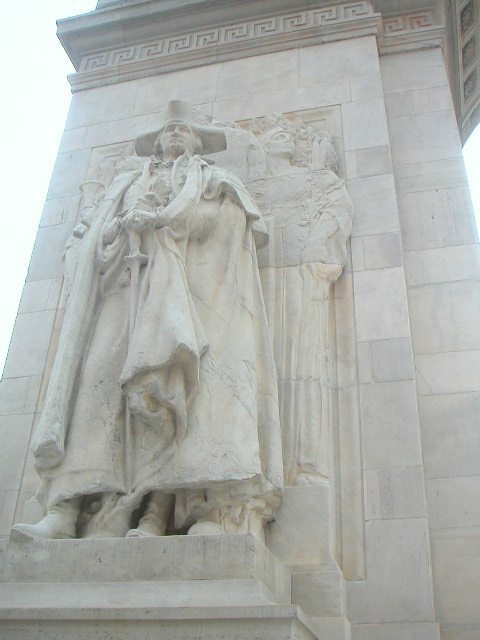 The temple of the Lincoln Memorial shelters Daniel Chester French's tribute to our 16th President. Enthroned in marble the seated Mr. Lincoln personifies the greatest struggle of the American experiment in its first century. Enshrined with him are the 438 words that rang out over the Gettysberg Battlefield Cemetery. Though he said "The world will little note nor long remember what we say here," history and the heart felt convictions of free people have proved that part of his dedication to be inaccurate. Categories : Location, Sculptures, Statue, Washington D.C.
Andrew Jackson tips his hat to the White House and the Washington Monument. 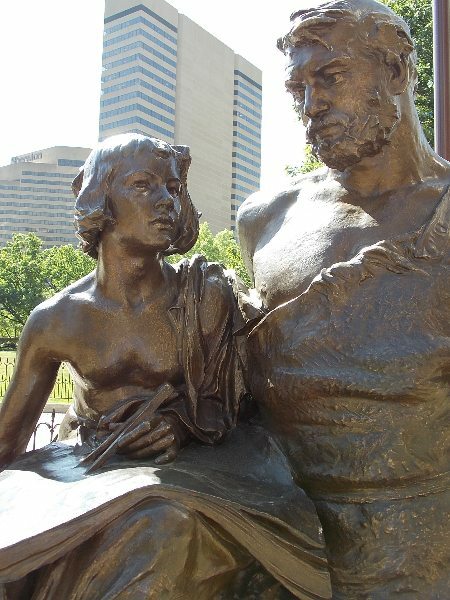 The statue cast by Clark Mill in 1853 occupies the center of Lafayette Square. I recently visited our nation’s Capitol with family. 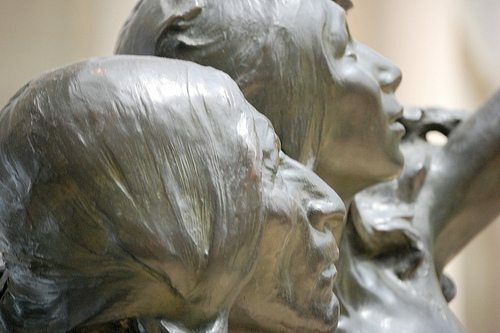 Sculpture and history are everywhere. On the way to the Supreme Court to take a few photos of MacNeil’s tortoise and the hare, I was lured away by a few wonderful sites. So the East Pediment of 11 figures (Moses, Confucius, Solon, the tortoise and the hare, and six others) would have to wait. 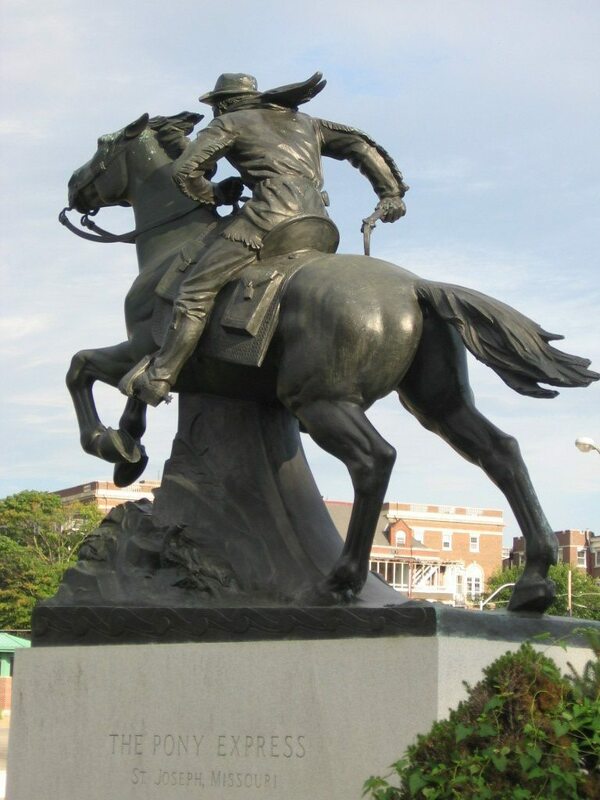 In front of the White House in Lafayette Square, I found Andrew Jackson rearing up on horseback and waiving his hat to the White House and Washington monument in the distance. 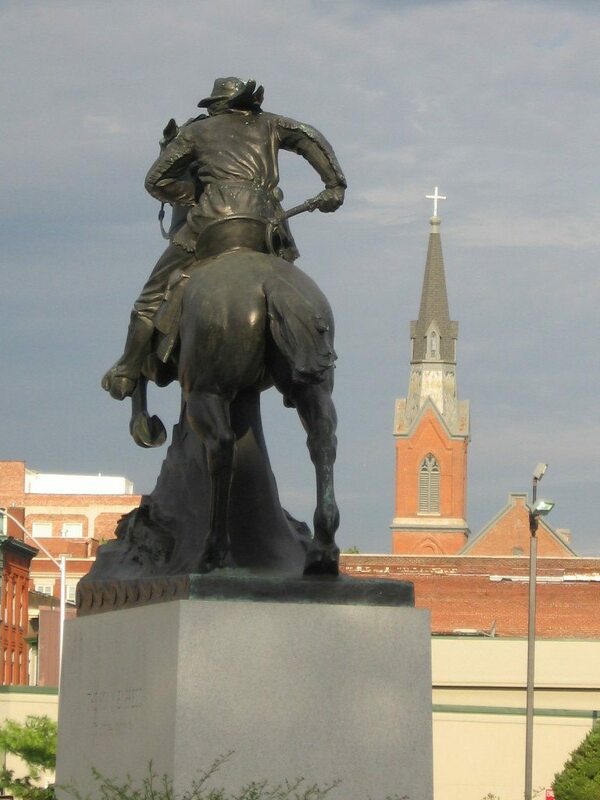 Apparently, he has been doing that pose for over 160 years when Clark Mills’ tribute to Jackson was emplaced. For more perspectives and close-up details on this piece click HERE at DCmemorials.com. 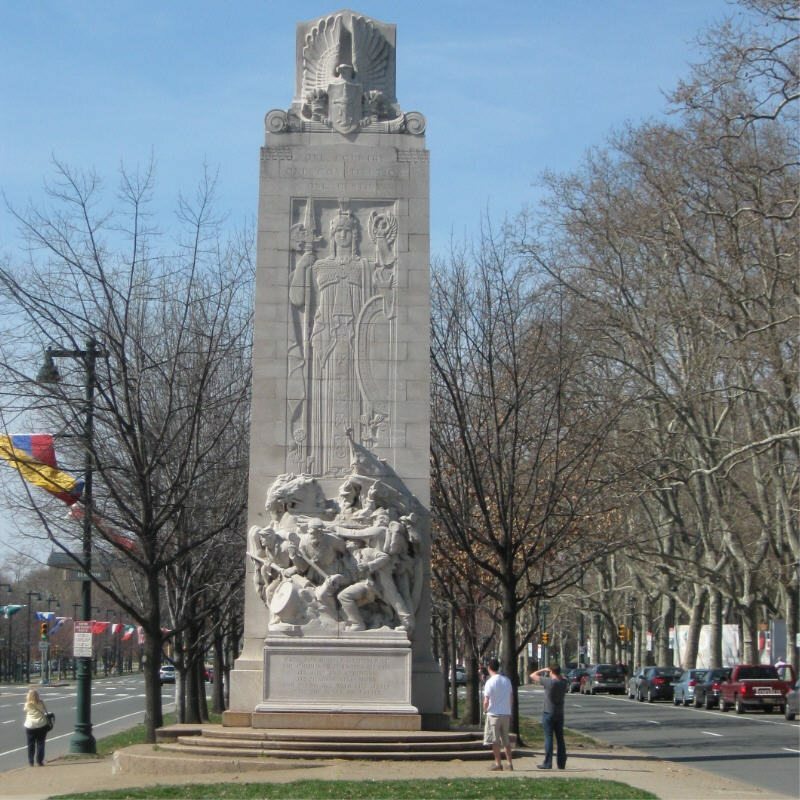 The First Division Monument of WWI was designed by Cass Gilbert. 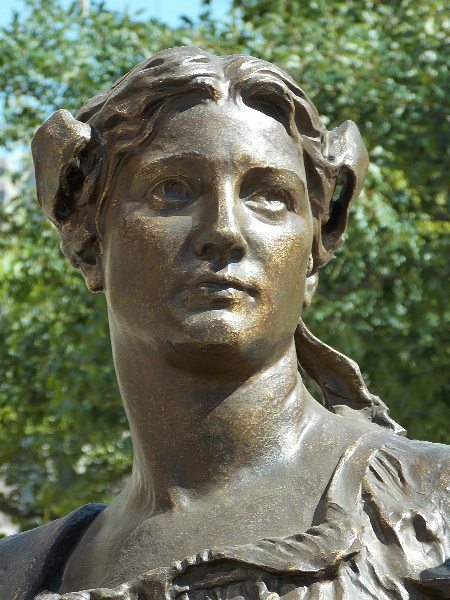 This golden "Victory" was the work of Daniel Chester French. Behind the Old Executive Office Building, high on a Roman column stood “Victory” by Daniel Chester French. 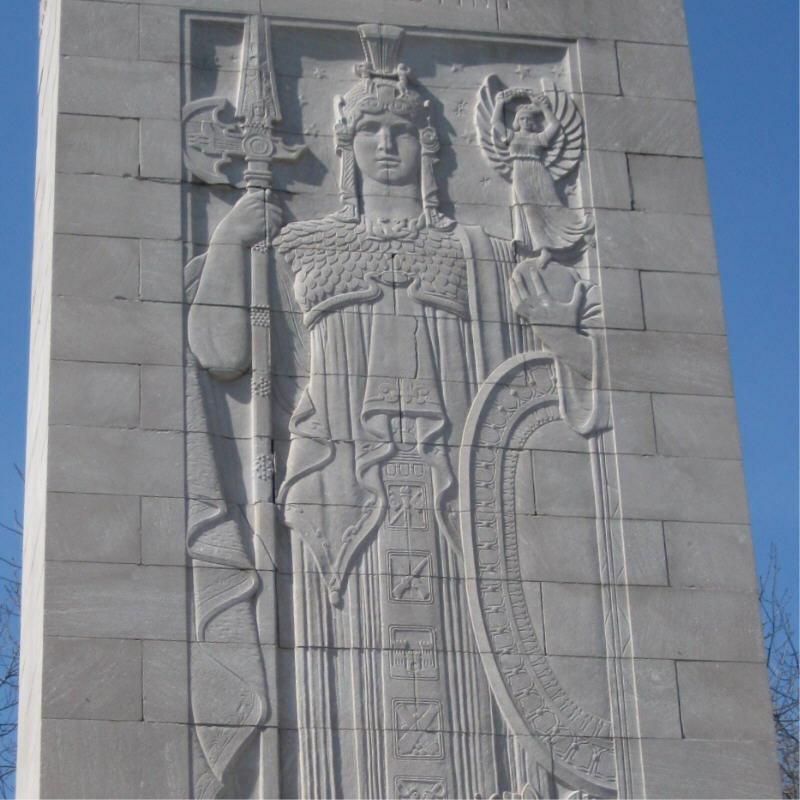 Cass Gilbert was also the architect of this WWI memorial to the First Infantry Division. 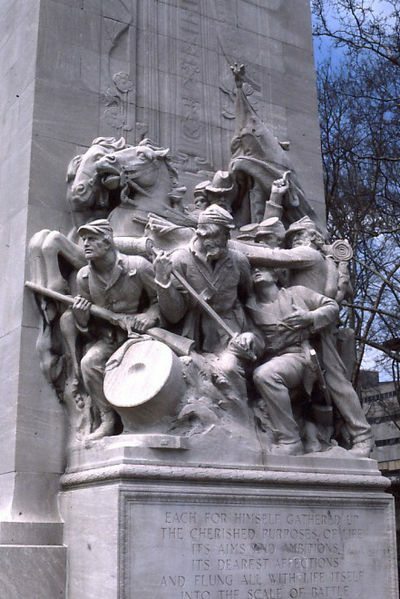 All of the funds for the monument as well as the additions were provided by the Society of the First Infantry Division. 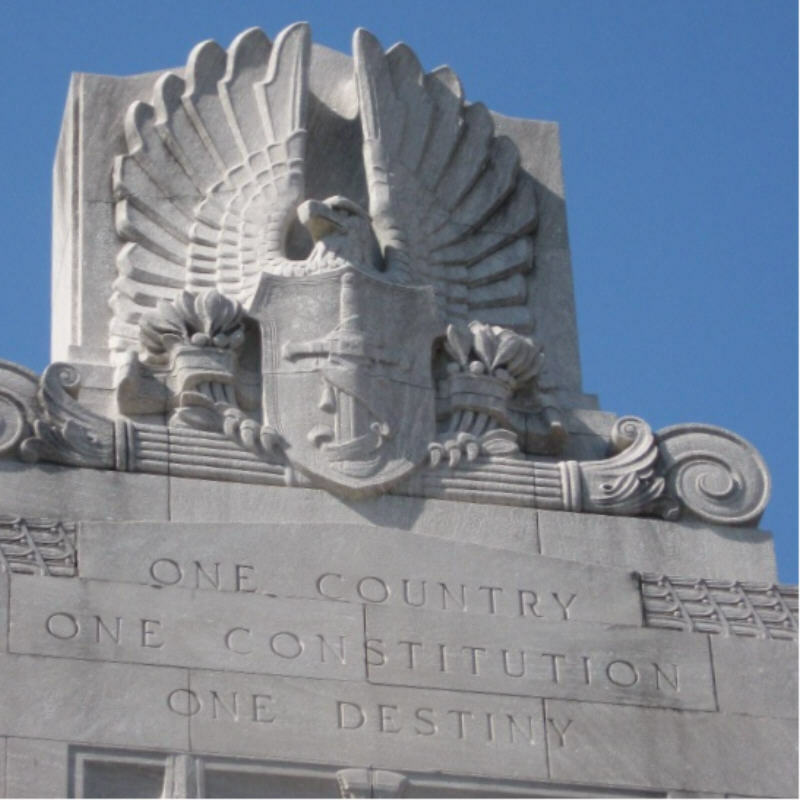 To see this full monument and others in the Ellipse and D.C. CLICK HERE. The StationStart.com website provides photos and history to accompany your ride on the Metro through the Capitol. On across the street stands the Washington Monument which is closed for structural repairs following the earth quake last year. Some mortar was loosened and cracks opened. But the spire stands tall and proud like the General himself. On down the hill to the west rests the WWII Memorial. Nestled into the center of the Mall, this oval dish of fountains, pools, and 56 state and territorial salutes gathers people into a living history. Veterans of WWII, some of the last remaining were there on that sunny Saturday morning giving dignity and flesh and blood to this stunningly compelling tribute. As a VA Chaplain, I found myself shedding more tears here and recalling the veterans I have been privileged to know. The WWII Monument is just down the hill from the Washington obilisk. Across the pool of fountains we see the 4048 gold stars and the Lincoln Memorial in the distance. ALL GAVE SOME - SOME GAVE ALL. 4048 Gold Stars commemorate the 404,800 American soldiers who died in World War II. ALL GAVE SOME – SOME GAVE ALL. These 4048 Gold Stars commemorate the 404,800 American soldiers who died in World War II. Each Gold Star here represents 100 dead. During the war, each mother of a veteran would place a Blue Star in the front window of the family home. A Gold Star is what a mother placed if a son had been killed in action. 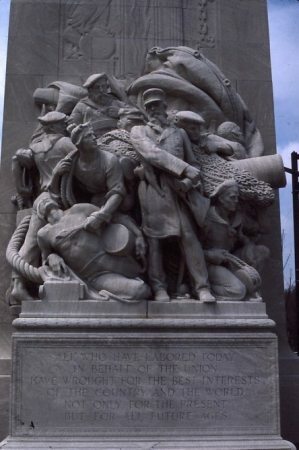 For more photos and history on this monument see HERE. 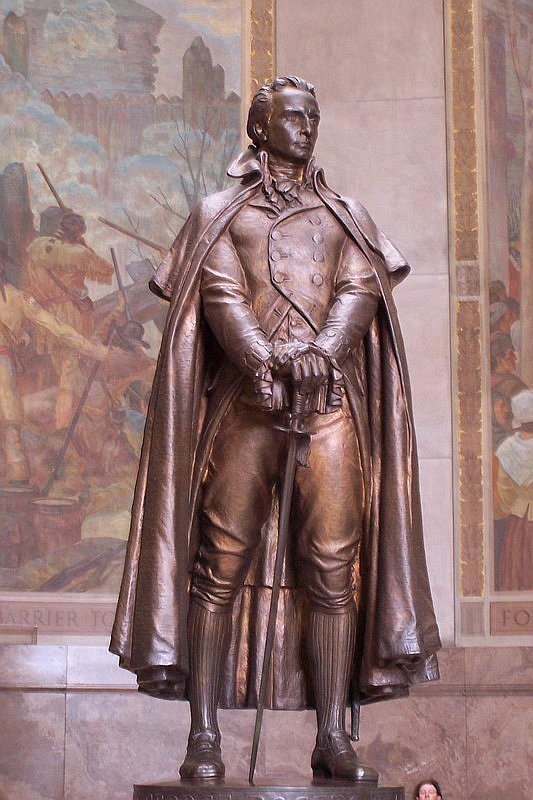 COMING: Next post will take us to the Lincoln Memorial to see Daniel Chester French’s most renowned sculpture. 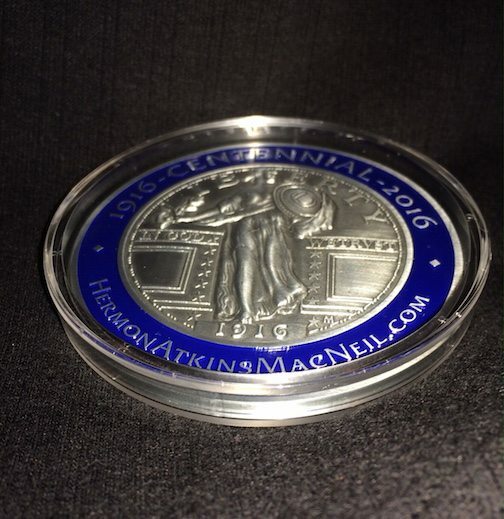 2016 MacNeil MEDALLION ~ Available eBay. Orlando Museum of Art, Orlando, Florida. "Sun Vow"
Reading Public Museum, Reading PA; "Sun Vow"
Will this “Confederate Defender” stay Standing? Lincoln Hall Revisited ~ 2017~ 6 year Nose Check-up! 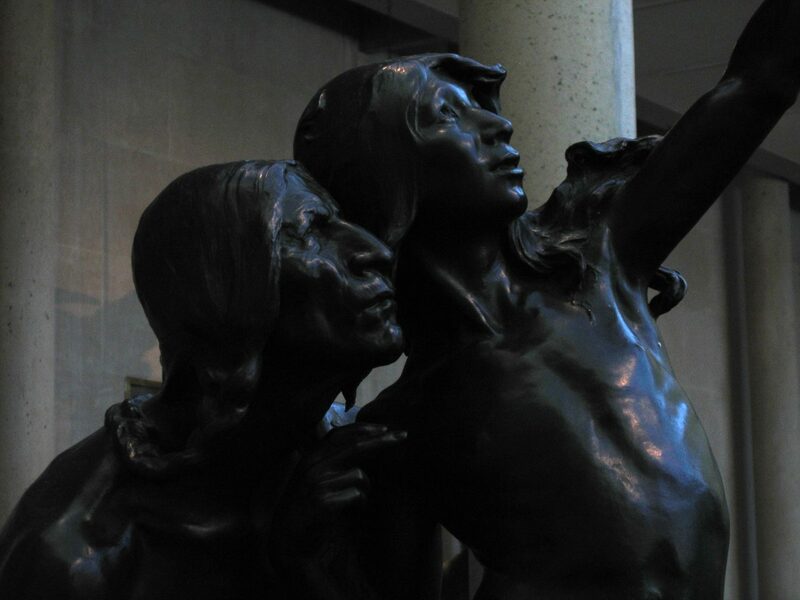 1931 Society of Medlists – "Moqui Dance for Rain"
Nearby or far away, there is no ONE place to go and appreciate this wide range of art pieces. Located in cities from east to west coast, found indoors and out, public and hidden, these creations point us toward the history and values in which our lives as Americans have taken root. Hosting & Tech Support: Leiturgia Communications, Inc.
1. 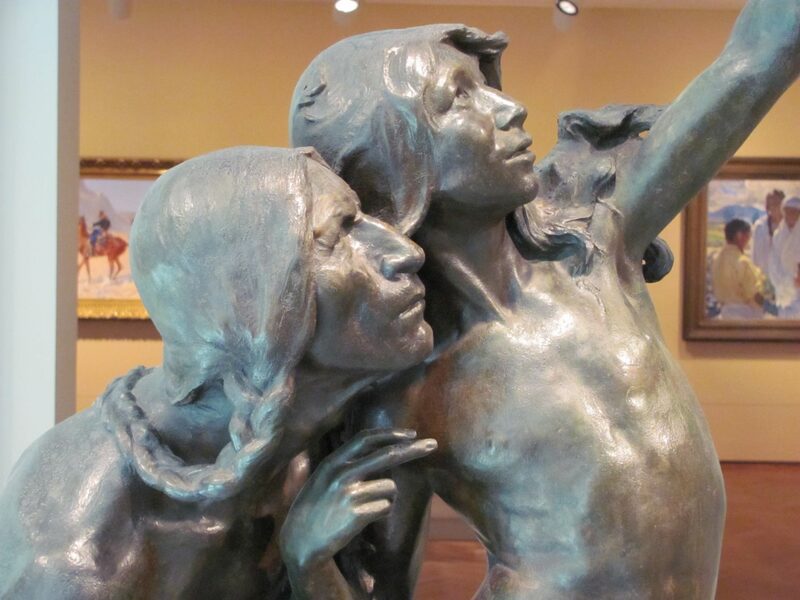 Take digital photos of the entire work from several angles, including the surroundings. 2. Take close up photos of details that capture your imagination. 3. 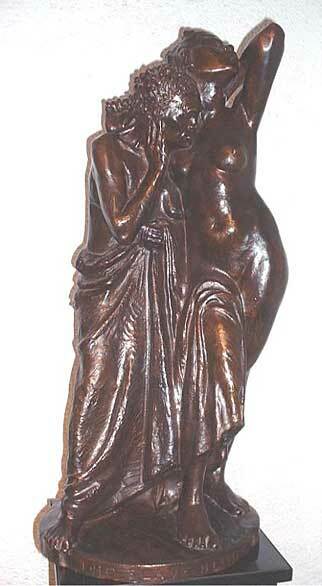 Look for MacNeil’s signature, often on bronze works. Photograph it too! See examples above. 4. Please, include a photo of yourself and/or those with you standing beside the work. 5. Add your comments or a blog of your adventure. It adds personal interest for viewers.